Teachers included: Dale Clevenger, Michael Hatfield, Charles Weaver, Lowell Greer and Arnold Jacobs. In April of 1990 Robert Danforth accepted the offer from Raymond Leppard and the ISO to fill the position of Principal Horn. At that time he was completing 6 ½ seasons in the same position with the Grand Rapids Symphony Orchestra. He has also held co-principal or associate principal positions with the Toledo and Omaha symphony orchestras, and the Cincinnati Chamber Orchestra. He has been fellow at the Tanglewood Music Center and a member of the Civic Orchestra of Chicago. Rob has performed as soloist on numerous occasions with the ISO as well as with other orchestras in the midwestern United States. He is an active chamber musician. Rob is Adjunct Associate Professor of Music at DePauw University. 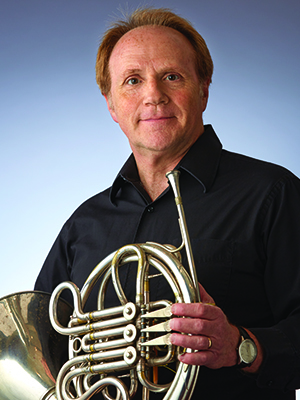 He has presented master classes and performed at numerous International Horn Society Symposiums, regional horn symposiums, and universities and conservatories. His main instrument is a Conn Schmidt model made in the 1930’s. Rob received his bachelor of music degree in 1981 from the College-Conservatory of Music at the University of Cincinnati, where he was a student of Cincinnati Symphony Orchestra Principal Horn Michael Hatfield. Other influential teachers have been Dale Clevenger, Arnold Jacobs, Lowell Greer, Charles Weaver, Robert Schauer, and Mary Berry. Rob was born in Detroit, Michigan, and grew up in St. Clair Shores, a suburb of Detroit. He and his wife Coral have four children: Libby, Madeline, Katie, and Andrew. As a newly minted empty nester he is wondering about all the spare time he was supposed to have but can often be found swimming, mountain biking, or on the back porch with a cup of coffee, the morning paper and the dog and cats.